Danish label Wood Wood took its streetwear sensibility to be one with nature in its collection ‘The Outside’. 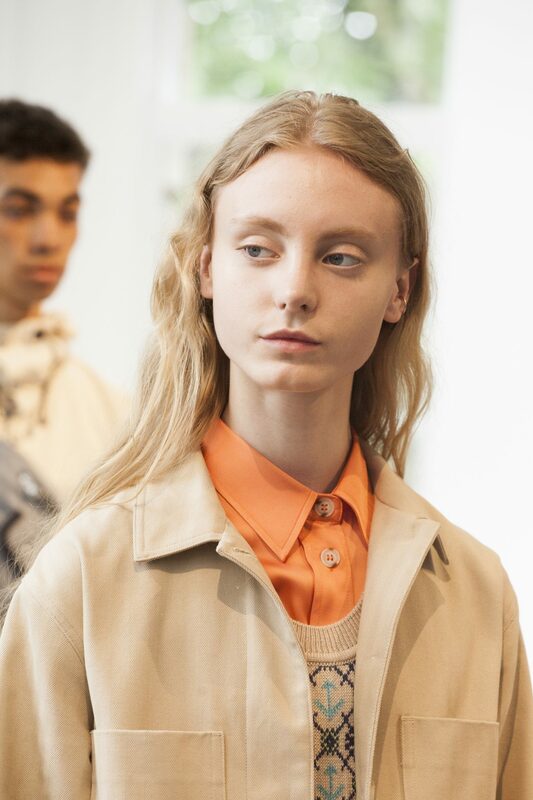 Keeping the 90’s sporty aesthetic that the brand is loved for, designers Karl-Oskar Olsen and Brian SS Jensen created a collection for SS19 that would see its customer through adventures in urban and natural environments. That mix was evident in the location, set in a clean white space surrounded by large windows, allowing the trees along the river to make an appearance in the background. The sounds of Fleetwood Mac and Simon and Garfunkel helped to create a chilled atmosphere. 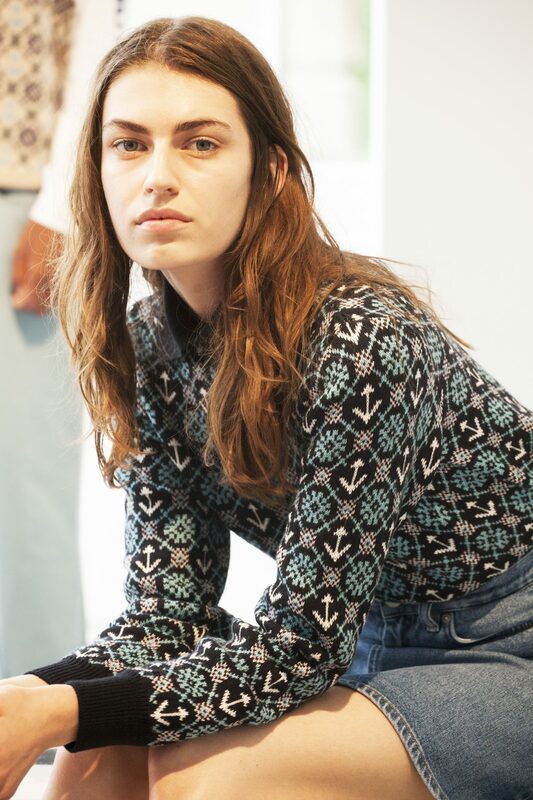 Wood Wood showed a selection of both menswear and womenswear, another example of brands merging presentations and challenging the fashion calendar. Whilst both sides had an overall easy-going yet functional feel, they also had their own individual markers. 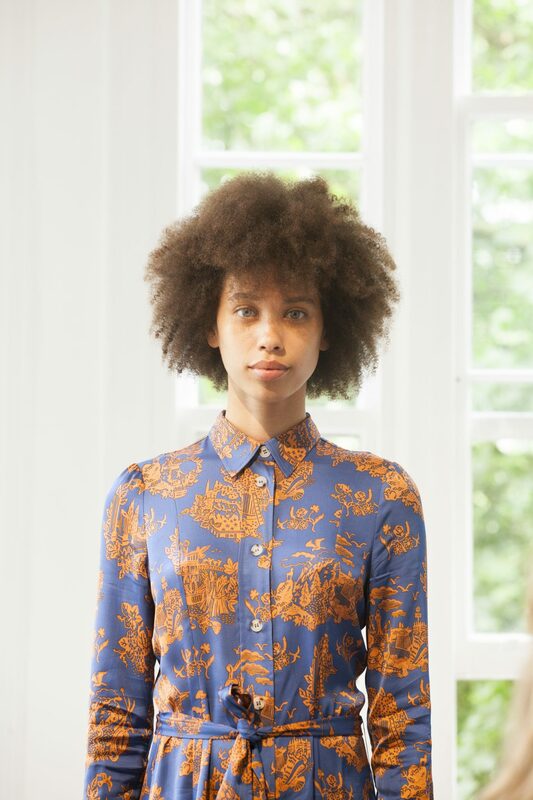 For womenswear, contrasting elements kept things fresh, whether that be in proportions or details; a baby pink dress paired with a boxy black jacket; a button stand positioned off-centre; drawstring in the neckline of a printed blouse. 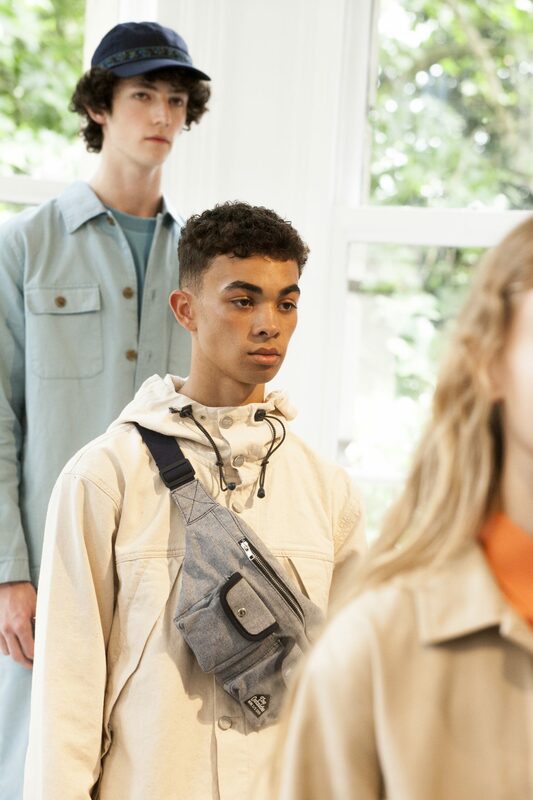 The workwear influence comes through in contrasting white stitching and loose suiting – paired with a rucksack slung over one shoulder, she is ready to go from the office to the mountains. 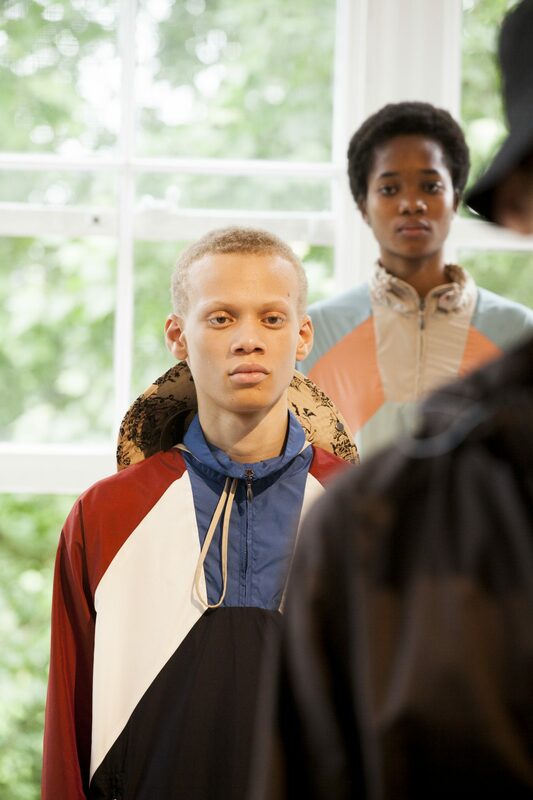 As for the menswear, the focus remained on Wood Wood’s sportswear pieces but with gathered elastic hems and tapes featuring prints echoed in the colourful women’s dresses. Classic tracksuit tops are reworked in durable denim and cotton twill, with a colour palette of beige, soft blues and oranges. 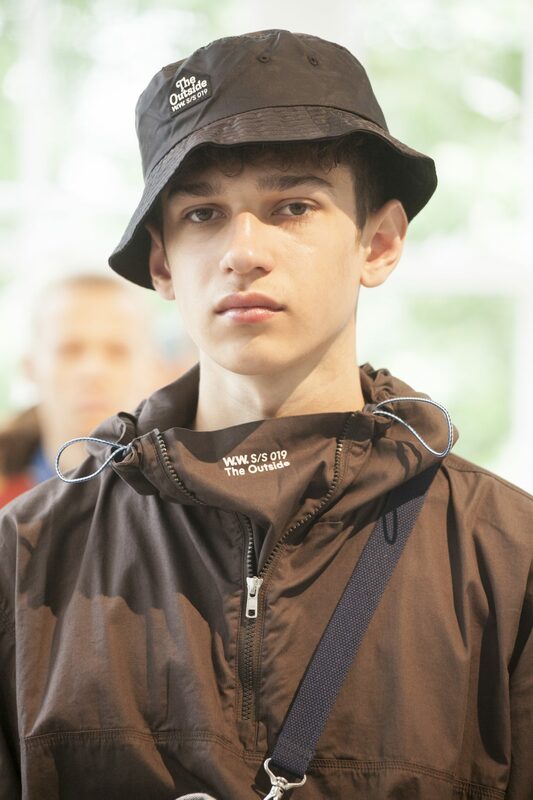 The styling further highlights the concept with bucket hats tied at the neck, cross-body bags and socks-with-sandals, a combination that is becoming quite the trend this fashion week, although not to be overshadowed by the unisex trainer that will surely be popular with buyers. These days, customers look for clothes that can multitask in various environments; Wood Wood offers just that.